After our first Green Hornet episode six weeks ago saw him thwart Nazi spies, we once again visit our masked crusader as he takes on political corruption, a most timely (and never-ending) subject it would seem. For those new to the Green Hornet, his real name is Britt Reid, publisher of the Daily Sentinel. While on a trip to the far east he saved Kato's life, and now Kato is his loyal companion and chauffeur of the forerunner to the Batmobile, the Black Beauty. The Green Hornet was a popular and long-lived radio series, running from January 1936 to December 1952. Though a pair of movies were made in the early 1940s, a TV show in the 70s, and a recent 2011 movie, none achieved the popularity of the radio show. 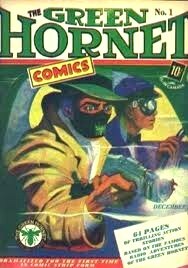 The Green Hornet was created for radio by George W. Trendle and Fran Striker. Over its 17-year run the Green Hornet's voice came from four actors. For its first seven years the Green Hornet was played by Alan Hodge (photo above right), whose voice I find particularly appealing since it sounds remarkably similar to the voice of Clayton Moore who starred as television's The Lone Ranger. It was Fran Striker, no less, who also created The Lone Ranger. The Green Hornet's trademark theme music is of course Rimsky-Korsakov's "Flight of the Bumblebee," and the buzzing sound of the hornet was created using a theremin (the perfect instrument used quite often and to good effect for many SF--and non-SF--movie sound effects as early as 1931). This episode, "Votes for Sale," aired on September 27, 1940 (a mid-term election year). Due to its subject matter and a political scandal recently in the national news, we dedicate this episode of The Green Hornet to the city of Chicago and its infamous "Chicago style of politics." And more specifically to former Illinois Governor--recently convicted of numerous federal corruption charges (including bribery), Rod "Blago" Blagojevich. I think that about covers it. 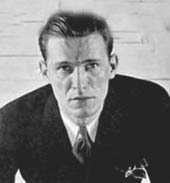 While the Green Hornet was fighting political corruption in 1940, science fiction fans were reading terrific stories from the likes of Harry Bates' and his "Farewell to the Master" (Astounding, Oct.), A. E. van Vogt's "Vault of the Beast" (Astounding, Aug.), and Theodore Sturgeon's superb horror story "It," from the August issue of Unknown. 1940 saw the first SF stories by Leigh Brackett, James Blish, C.M. Kornbluth and Richard Wilson in collaboration, and Frederik Pohl. Born in 1940 were Thomas Disch, Alexei Panshin, and Norman Spinrad, who weren't quite old enough to enjoy this episode of The Green Hornet.